Long Branch New Jersey natives, The Acerras, who fielded a semi-pro baseball team with a total of 12 brothers, were coached by their father, Louis “Pop” Acerra Sr. during the team’s amazing 14 year existence from 1938-52. Louis and his wife, Elizabeth had 17 children in all. The team consisted of Alfred & Edward as catcher, James & Robert on the mound, Charles on first base, Louis Jr. at second base, Fred at shortstop, Richard at third base and rounding out the team Paul, Joseph, William & Anthony in the outfield. 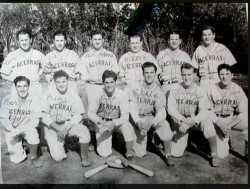 The Acerra baseball team formed officially in 1938 under Pop’s guidance and over the next 14 years, played throughout the East Coast, including Pennsylvania, New York and Connecticut. The sibling squad even challenged the New York Yankees to an exhibition in 1948. The team stayed together through a number of events, including World War II, in which 6 brothers enlisted at different times. Members of the team turned down college scholarships and offers to play professional baseball in order to keep the family team together. Alfred, the catcher, continued to play after losing sight in one eye. Along the way, the Acerra’s received a great deal of national media attention, appearing in magazines such as Life and Look and in the 1947’s edition of Ripley’s Believe it or Not. The age difference between oldest brother, Anthony, to the youngest, Louis Jr. was 25 years. While being scouted by major league teams, their playing ages were as young as 17 and as old as 40. For 22 consecutive years The Long Branch High School baseball team fielded an Acerra brother. With only 16 other known “all brother” baseball teams, no other has played as long or accomplished as much as the Acerra Brothers. The brothers appeared on Bill Brandt’s “Inside of Sports” radio program during his nightly “Once in a Lifetime” feature, City League champions 4 out of 6 years and two time runners up and were honored by the National Baseball Hall of Fame in 1997 over Father’s Day weekend. Although now all deceased, there were 7 living brothers who attended the honor in Cooperstown. The amazing story of this all-brother team is truly one for the books. So much so that in 2012, author Audrey Vernick wrote about their history in a colorful depiction of their lives in Brothers at Bat. The Acerra Brothers were inducted posthumously into the National Italian American Sports Hall of Fame in 2017.